A beautiful tapestry tells a story with color, texture, and complexity. It inspires the viewer to experience many different emotions. 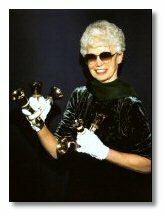 Likewise, Sue's performances as a handbell soloist become a tapestry that evokes these same feelings through music. The changing tones and techniques are interwoven to form an aesthetic whole. Expressive visual and aural artistry create an exciting musical design. The combination of sound and movement leads to an enchanting musical experience...truly a handbell tapestry.